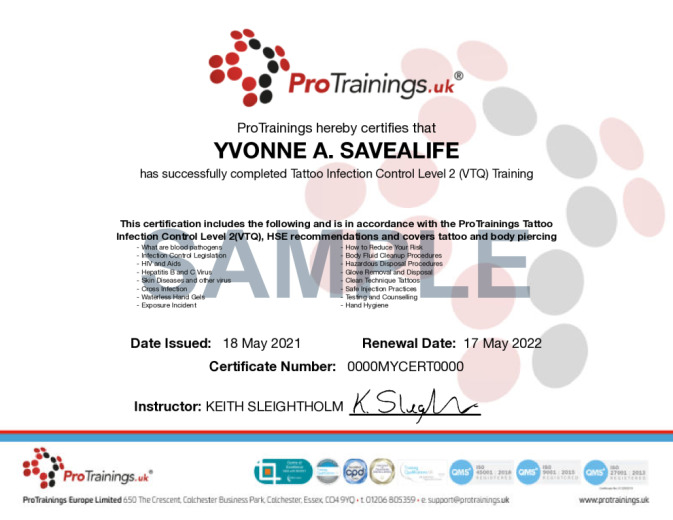 If you are working in any aspect of the Tattooists industry or Body Piercing, you will need to have an understanding of many different aspects of infection control to keep you and your clients safe. Blood Borne Pathogens can be spread with needles and other items of equipment you use and there is a requirement to have basic training in correct infection control technique. This course covers the possible dangers that you could come across and how with basic good practice you will keep safe and increase the trust with your clients. This course comes with 3.0 hours of CPD, although the time to complete the course online may be less than this. Total course time includes 1 hour and 19 minutes of video training as well as knowledge reviews, final test, remedial help and reviewing downloaded material.